Not too long ago, yeeyan was closed. The reason was well known by the yeeyaners. What we say? It could be "Much better than feudalism, you might have died for 10 times." Like Phoenix TV, a lot of people know that it's actually a RED media. It just looks like "neutral". Even so, when rebroadcasting in mainland China (not broadcasting in the whole nation, but a few big cities in the south), the program would be blocked when related to some so called "sensitive topic". 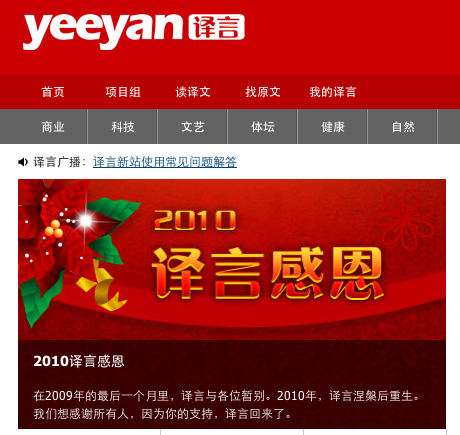 When yeeyan was created, a lot of yeeyaners had worried about the closing issue, which is ironically called "being concordant". There is always a good excuse for this kind of action -- To clear the environment of internet. It's good to see that yeeyan comes back one month later. Very complicated to describe the feeling. Just say, congratulations.